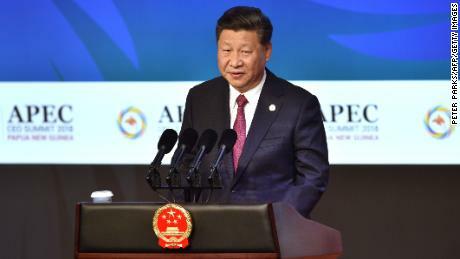 All 21 APEC leaders at the annual meeting in Papua New Guinea were in agreement except China, a source within the meeting told CNN.Canadian Prime Minister Justin Trudeau confirmed late Sunday that disagreements on trade stood in the way of a final statement. "There are differing visions on particular elements," Trudeau said.China may have been concerned about a specific line about unfair trade practices, according to a US official involved in the negotiations. The two countries are embroiled in a bitter trade war that has seen each enact tariffs on billions of dollars worth of goods.The official said the most "problematic" line for the Chinese was: "We agree to fight protectionism including all unfair trade practices. ""They seemed to think that the 'unfair trade practices' was some kind of singling out," the official contended. "It's a little concerning that it appears that China didn't really have any intention in the end of reaching consensus," the official said.The Trump administration has repeatedly accused China of unfair trade practices to justify the tariffs it has imposed on $250 billion of Chinese goods. "For many years, China has pursued industrial policies and unfair trade practices … that champion Chinese firms and make it impossible for many United States firms to compete on a level playing field," the White House said in a fact sheet in May about Trump's confrontation with Beijing over trade.Vice President Mike Pence, who attended the forum in President Donald Trump's place, told the gathering in Port Moresby that "China has taken advantage of the United States for many, many years and those days are over. "The language in Pence's speech echoed his landmark address last month on China, during which he said the United States "will demand that Beijing break down its trade barriers, fulfill its obligations, fully open its economy — just as we have opened ours." In his speech on Saturday, Chinese President Xi Jinping spoke of the need for global cooperation and trade and said all differences could be bridged "through consultation." 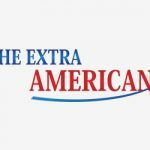 "History has shown that confrontation, whether in the form of a cold war, a hot war or a trade war, will produce no winners," Xi said to applause.China's Global Times, a state-sanctioned tabloid that often promotes hawkish viewpoints, released an editorial Monday stating that it was "not a big deal" that the APEC summit ended without a joint communique for the first time in a quarter of a century.The piece also accused Trump's administration of spreading falsehoods about China's abuse of international organizations like the World Trade Organization. "It's delusional of some US elites to think that China is the largest beneficiary of the international system since they mistakenly blame China for the US' own problems. China has realized its development through hard work, not by taking advantage of the international system," the piece read. Pence said Washington wouldn't ease the trade war with Beijing until it "changes its ways" in his Saturday address.The Trump administration has levied tariffs on $250 billion in Chinese products since July. The tariffs on $200 billion of those goods are set to increase to 25% from 10% on January 1, which would further escalate the conflict.China has so far retaliated with tariffs on $110 billion of US products and is likely to respond with more if the United States goes ahead with the increase at the start of January.Pence also knocked China for loans to developing countries in the Pacific and beyond. "The terms of those loans are often opaque at best. Projects they support are often unsustainable and of poor quality. Too often, they come with strings attached and lead to staggering debt … The United States deals openly, fairly. 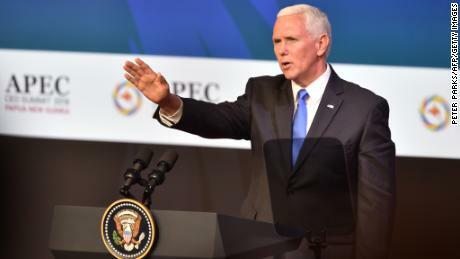 We do not offer a constricting belt or a one-way road," he said, mocking China's One Belt, One Road initiative.China's Foreign Ministry lashed out at Pence for his remarks. "Our advice for the relevant country is that instead of pointing fingers at others, it would be better to match its deeds with its words and truly treat all countries, big or small, as equals," Chinese Foreign Ministry spokeswoman Hua Chunying said in a statement. "Not a single developing country has been mired in debt difficulties because of its cooperation with China. On the contrary, their cooperation with China has helped them enhance their capacity for self-driven development and improved their people's livelihood," Hua said about Pence's allegations on loans. Further fanning the flames, Pence announced the US would partner with Australia and Papua New Guinea to develop a naval base on Manus Island in Papua New Guinea. Pence did not give details of the development of the base, but the announcement comes as Washington is trying counter a substantial Chinese military buildup in the South China Sea and beyond.Most of the region's attention was focused on Port Moresby. The US military commander in the Pacific, speaking at a conference in Canada, accused China's military of "a sustained campaign to intimidate other nations in the East and South China Seas" by fortifying manmade islands. "What was a 'Great Wall of Sand' just three years ago is now a 'Great Wall of SAMs' (surface-to-air missiles) in the South China Sea," Adm. Phil Davidson told the Halifax International Security Forum in Nova Scotia.Davidson said the islands and the armaments on them give Beijing "the potential to exert national control over international waters and airspace through which over $3 trillion in goods travel every year, along with commercial air traffic. "China says its installations on the South China Sea islands are necessary to protect its territory and has criticized repeated US naval and air operations near the islands. 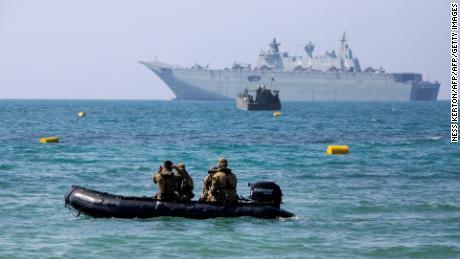 "Some countries, which are outside of the region, ignore China's firm opposition and conduct reconnaissance in the name of 'freedom of navigation,' show off military power, threaten China's sovereignty and the safety of Chinese stationed staff, which could easily cause marine and air accidents, and damage regional peace and stability," China's Foreign Ministry said in a statement sent to CNN in August.But Davidson said it was China that posed a threat to sovereign rights with military intimidation. "They're now violating the sovereignty of every other nation's ability to fly, sail, and operate in accordance with international law," Davidson said. CNN's Eric Fiegel, Steven Jiang, Ben Wescott, Joshua Berlinger and Chandler Thornton contributed to this report.